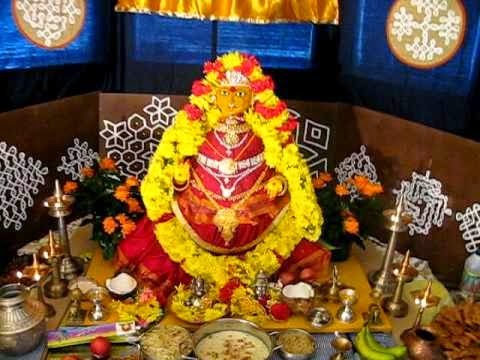 of Andhra Pradesh and Karnataka and some parts of Tamil Nadu.The Hindu festival going by the name 'Vara Lakshmi Vrata' is celebrated on the last Friday of the bright fortnight in the month of Ashadha, also called Adi, which corresponds to the English months of July-August. and offer to god as naivedyam / blessed food. The history of the origin Of the Vara Lakshmi Vrata is rather interesting. Lakshmi is said to have visited a pious woman by name Sarmadi, living in the city of Kuntinapura in Magadha (Bihar), in in one of her dreams and expressed her satisfaction at her devotion to her children. When she woke UP from her sleep, she took a bath and worshipped Lakshmi to ensure her blessings. When the other ladies heard of her dream and her worship of Lakshmi, they too began to worship her, and the custom is then said to have spread everywhere throughout the land in course of time. This pooja can be done with no restriction to caste or creed. To this day, the faithful of modern times observe this tradition.